Neither single N dopant nor single VSi can introduce FM. VSi together with NC would yield ferromagnetism. The FM and AFM were competition for the charge states. The overlap density of two C atoms and N atom leads to FM coupling. 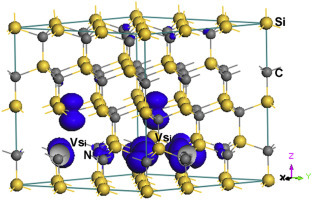 First-principles calculations were performed to investigate the electronic and magnetic properties of silicon vacancy (VSi) and nitrogen doped silicon carbide (4H-SiC). VSi or nitrogen-doping alone cannot form ferromagnetic ordering. VSi together with the substitution of nitrogen for carbide would yield ferromagnetism in 4H-SiC crystal. The most stable configuration was identified by energy calculations. The magnetic coupling calculated results demonstrated that the ferromagnetic states and antiferromagnetic states competed with each other for the charge states. The magnetic orbital of two C atoms overlap around the VSi and the nearby substituted N atom, the overlap density leads to a ferromagnetic coupling between the two C atoms.